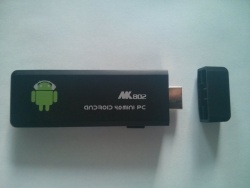 This is a completely redesigned version of the MK802 HDMI Stick. The most stricking difference is that it has a male HDMI connector for plugging straight into a monitor or TV. It seems that there are at least 2 different case designs for the MK802II. They both share the same innards though. For building u-boot, use the "mk802ii" target. For building mainline u-boot, use the mk802ii_defconfig board name. Use the sun4i-a10-mk802ii.dts device-tree file for the mainline kernel. There is a hole next to the SD slot, under which is the "uboot" button which triggers FEL mode. The bottom cover clips into the top cover, so you need to push the sides of the top cover outwards with your plastic tool. Start at the HDMI connector, as you have some purchase there. The mainboard is clicked into the top cover, and also requires some wriggling to get out. There are some minuscule pads on the bottom side of the board, as shown in the picture. You need to have decent soldering skills to be able to attach wires to those. More information is available in the UART howto. The back view of the different case. 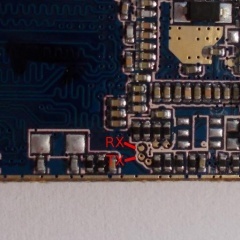 The exterior is clearly marked as MK802, but neither shares the board or the case with that device, and the formfactor is slightly different. Rikomagic MK802: The original MK802. This page was last modified on 30 August 2015, at 02:34.